If you are looking for a personalized way to share your favorite photos, make a photo slideshow. It is a way in which to capture precious memories and relive them. Maybe you've seen how Mac users can make a great slideshow from photos and heard it's really easy, but where do you start? Actually, making a stunning slideshow with photos shouldn't be difficult, frustrating or extremely time consuming. 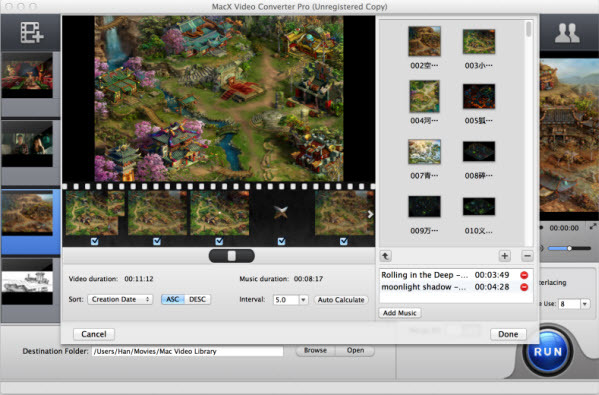 This article will take you through MacX Video Converter Pro to create beautiful slideshows with music on Mac so you'll be amazing your friends and family in no time at all with this quick yet impressive trick. This top Mac photo slideshow maker is an absolutely powerful yet easy-to-use tool. With intuitive interfaces that are simple to navigate and minimal learning curves so you can easily but professionally make photo slideshows with music on Mac in a timely manner. Step 1: Import the photos folder. Firstly, you should put all the photos you want in a folder. It's best to arrange the photos in the order you want them to appear before you go into slideshow mode. Then click "add photos" button and select the entire folder for making the slideshow. Select an output video format or gadget for your slideshow - AVI, MP4, MPEG, MKV, WMV, iPad, Android and more. Use the "Browse" button to specify destination folder for saving output files. Step 3: Adding background music. One popular option is to include music that plays while the slideshow is displayed on the screen. To add background music, first click on the "add music" button. You can add more than one songs as background music. Step 4: Click "RUN" to create slideshow with music. Then you can watch the slideshow on your Mac computer or TV for viewing photos in an interesting way. Also you can upload the stunning slideshow to Facebook and YouTube for sharing with friends. Here is a list of the top free Mac video converter for you to convert among HD and SD videos on Mac, like MKV to AVI, AVI to MP4 etc; and convert video to iPhone, iPod, iPad, do not miss this to convert video free with best free video converter for Mac. The guide shares a No.1 photo slideshow maker specially designed for Mac users to convert a myriad of pictures into a stunning video slideshow on Mac easily, so that you can share the show on YouTube, Facebook, iPhone, iPad, etc. This review article gives detailed information of Samsung Galaxy Note 2 and iPad Mini. Through comparison and contrast, you will have a better understanding of both Samsung Galaxy Note 2 and iPad Mini.